Home » healthcare » parenting » Not Crying But Baby's Eyes Are Always Watery, What Are These Conditions? Not Crying But Baby's Eyes Are Always Watery, What Are These Conditions? 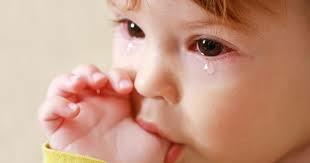 Not Crying But Baby's Eyes Are Always Watery, What Are These Conditions - babies often cry a lot, sometimes parents worry about the tears running out due to crying. However, there are babies whose eyes runny even though they are not crying. What causes the baby's eyes to runny and is this condition dangerous? Come on, see the answer below. Nasolacrimal duct obstruction is a blockage that occurs in the outlet of the tear. The occurrence of blockage is what causes the baby's tears can not flow into the nasal cavity and eventually give symptoms of the baby's eyes are always runny. The blockage that arises since the baby is born is caused by the presence of membranes that block the end of the outlet of the tear. The blockage of this canal causes tears to flood and symptoms develop, namely, the baby's eyes runny and look teary. In some cases that are quite severe, tears not only look like they glaze over but can melt continuously so that they hurt and cause irritation to the baby's cheek area. Indeed the membrane covering the outlet of the tear occurs in nearly 50 percent of babies born. However, most of them will recover (the membrane is open) by itself within 4-6 weeks after the baby is born. Are there any symptoms other than a baby's watery eyes? Most babies will only show symptoms (Not Crying But Baby's Eyes Are Always Watery, What Are These Conditions) of eyes that look runny or tears that melt continuously. In some cases, the infection can occur in the outlet of the tear so that there will be redness, swelling, and pus coming out of the inner corner of the eye. Can it be cured without medication? Wash your palms before touching the baby. Place your index finger on the corner in the baby's eyes. Make a gentle massage down. This action can be done repeatedly in a day. If you are still having trouble doing so, bring your baby to the general practitioner or to the nearest ophthalmologist. What happens if the blockage is not open? These conditions generally require further treatment by an ophthalmologist. The first step that is often taken is probing. This action can be performed on children who have reached the age of a year but still have blockages or at an earlier age but have severe symptoms. The action is done by inserting a fine wire in the corner area in your child's eye to open the blockage that occurs. Even though it sounds a little scary, you don't need to worry. Because if done by an ophthalmologist, this action includes safe action.